I'm having general trouble with calculating Ripley's K function values. 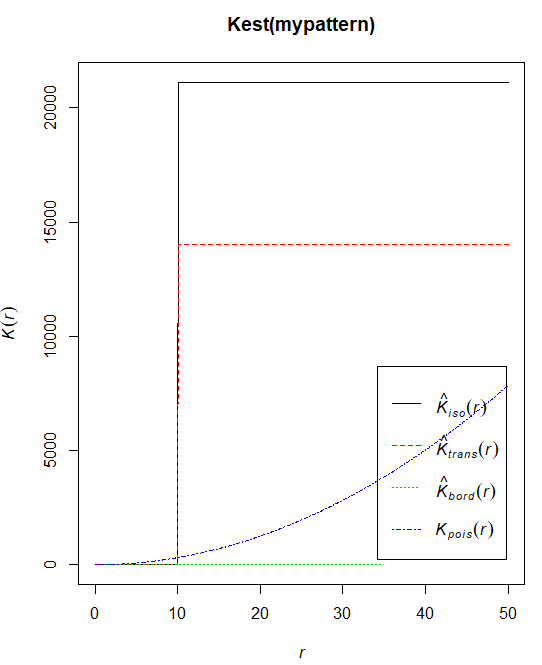 The problem is, I'm completely failing to understand how does R get K(10) ~ 21000. I is the indicator function, which should be set to 1, if u is smaller or equal to radius, and 0 otherwise. First off, let's calculate the weights: Weight of point #1 obviously equals 1. However, #2 and #3 are near the domain edge, and since they have the same x coordinate, and aren't near the upper boundaries, they're going to be equal. The weight will be the blue, boundary area divided by the area of the red sphere. 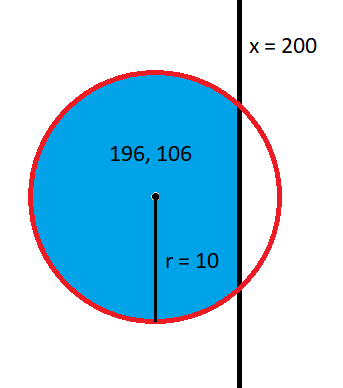 Boundary area is equal to the area of the red sphere minus the area of the white circular segment. Only the points #2 and #3 are within each other's radius, so the indicator function will be set to 1 only twice: between #2 and #3 and vice versa. Which is vastly smaller than R's ~21000. What am I doing wrong here? 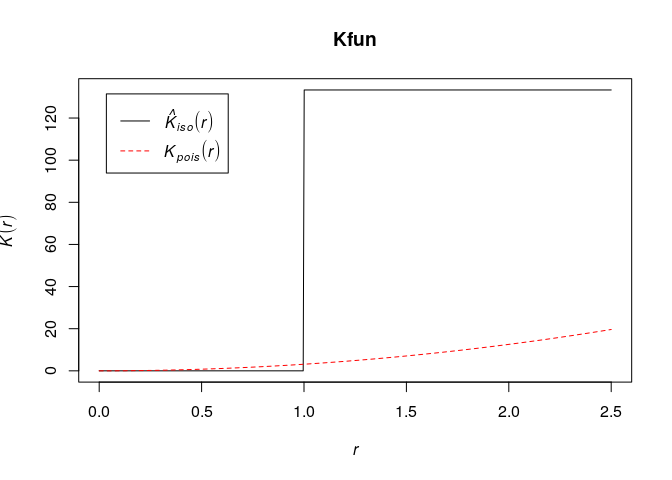 Is this some simple math mistake I've made somewhere, or is there something about R's Kest function that I'm missing? The weights are given in terms of circumference and not area. 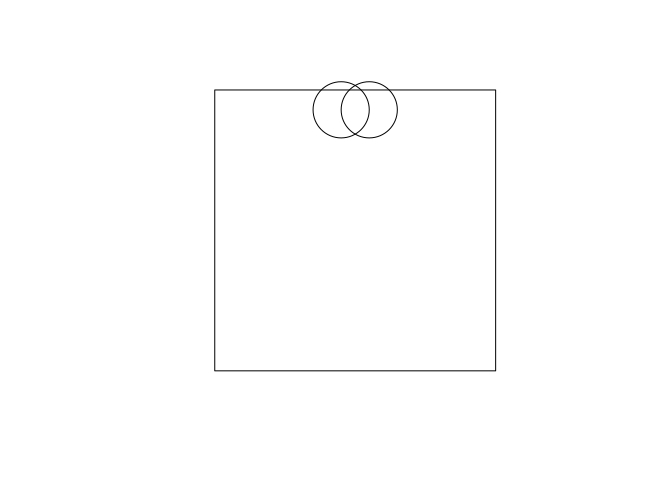 The weights are greater than or equal to 1 (inverses of what you describe – with area replaced by circumference). You can find the weights in spatstat using edge.Ripley(). The following example has two points separated by r = 1 with 1/4 of the circumference outside the 10x10 window (i.e. area 100). Thus the value should jump from 0 to 100/(2 ⋅ 1) ⋅ ((3/4) − 1 + (3/4) − 1) = 100 ⋅ 4/3 = 133.333. Not the answer you're looking for? Browse other questions tagged r mathematical-statistics spatial point-process or ask your own question.